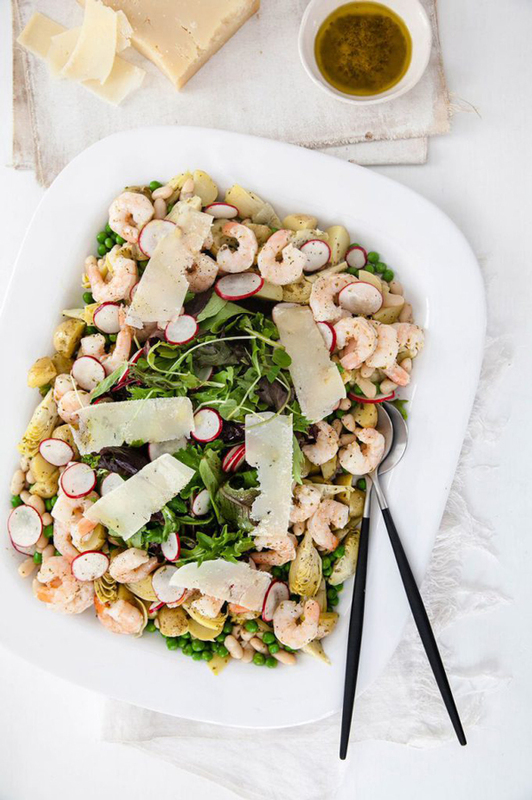 The sweet and fresh flavour of this salad will really get you in the mood for spring! Place all the vinaigrette ingredients in a blender and puree. Taste and adjust seasoning. You may want to add more honey, mint or salt. Heat 2 tablespoons Colavita Olive Oil in heavy large nonstick skillet over high heat until hot. Add the shrimp and sauté until cooked through, about 3 minutes. Using tongs, transfer shrimp to plate and season with salt and pepper. Cook peas in large pot of boiling salted water until just tender, 4 to 5 minutes. Transfer peas to an ice bath to cool. Drain them and pat dry. Once the peas have drained, place them in a small bowl and toss with 2 tablespoons of the vinaigrette. Place potatoes in large saucepan. Add cold water to cover potatoes by 1 inch, along with ¼ tsp salt. Bring to boil and cook until potatoes are tender, 10 to 15 minutes. Drain the potatoes and let them cool for 5 minutes. Once the potatoes are cooled, quarter them with a sharp knife. Place the potatoes in a large bowl. Add the White Beans and ¼ cup vinaigrette; toss to coat. Season to taste with salt and pepper. Add 1 more tablespoon of the vinaigrette if the mixture seems dry. 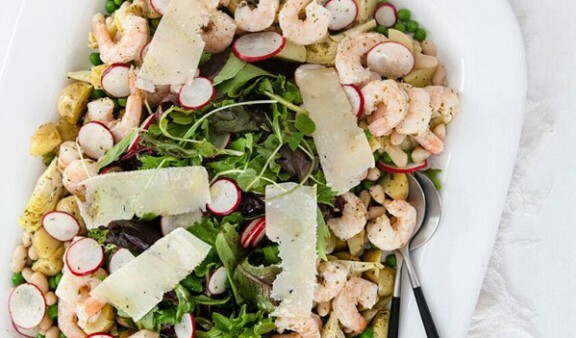 Place greens and radishes in a large salad bowl. Toss with enough vinaigrette to coat. Arrange potatoes, peas, beans and artichoke hearts on top of the greens. Place the shrimp on top. Garnish with shavings of Parmegiano-Reggiano cheese. Serve immediately. This recipe was provided by Colavita.